The first Project 21180 icebreaker is expected to be delivered to the Russian Navy in November 2017. Image courtesy of JSC "Admiralty Shipyards". The Project 21180 icebreaker has a maximum speed of 15kt. Image courtesy of JSC "Admiralty Shipyards". The hull depth of the Project 21180-class icebreakers is 9.2m. Image courtesy of JSC "Admiralty Shipyards". The first of four Project 21180-class icebreakers was launched in June 2016. Image courtesy of JSC "Admiralty Shipyards". 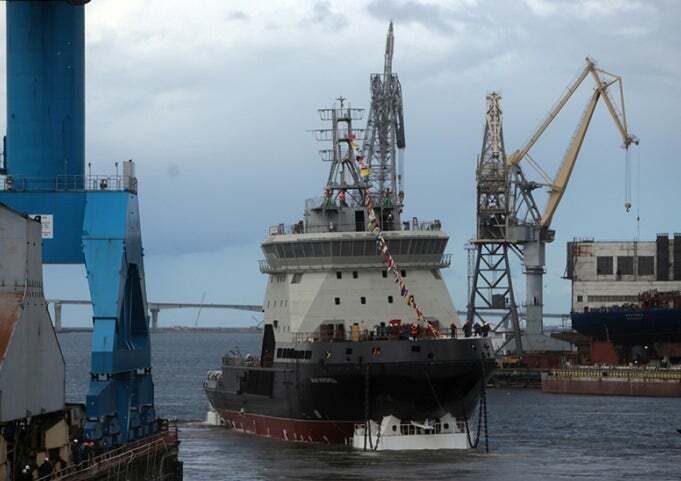 A series of four Project 21180 multi-purpose vessels are being built by JSC Admiralty Shipyards, a company headquartered in St. Petersburg, Russia, for the Northern Fleet of the Russian Navy. The Project 21180’s primary mission is to provide icebreaking services for the Russian naval forces deployed in the Arctic zone and the Far East. The vessel is also suitable for other missions such as patrol, oil spill response, tow combat ships, cargo transportation, and research in Arctic waters in the fields such as hydrography, oceanography and meteorology. The Russian Ministry of Defence awarded a contract to JSC Admiralty Shipyards in 2014 to build four Project 21180 icebreakers to replace the Russian Navy’s auxiliary ships. The keel for the first icebreaker in the series, named after epic hero Ilya Muromets, was laid in April 2015 and its launching ceremony was held in June 2016. The vessel is expected to be delivered to the Russian Navy in November 2017. Featuring a single deck, the Project 21180 icebreaker is manned by 35 personnel and is capable of carrying an additional 50 people. The vessel is 84m-long and 20m-wide, and has a hull depth of 9.2m, a draught of 7m and a displacement of 6,000t. Its cargo deck area is 380m² and cargo hold is 500m³. The forward section is equipped with a helipad to support the operation of a single Ka-32 type helicopter. The vessel can carry small boats, deployed through the stern launch-retrieval unit, for use in patrol and transportation missions. It also features a towing winch, fire detection system, galley equipment, and a 300m³ waste oil storage tank. The icebreaker is commanded from the navigation bridge located forward on the deck, using an automation and control system. The bridge offers operators with improved all-round visibility through the square windows. It is equipped with advanced navigation systems including electronic chart display and information system, which ensures safe operation at sea. The communications and radar antennae mounted on top of the bridge provide reliable communication for the vessel. The Project 21180-class is powered by a diesel-electric propulsion system, driving rudder propellers of 3.5MW each. "The Project 21180’s primary mission is to provide icebreaking services for the Russian naval forces deployed in the Arctic zone and the Far East." The electric propulsion system was supplied by Krylov State Research Centre’s affiliated branch TSNII SET (Ship Electric Engineering and Technology Research Institute) under a contract awarded in January 2015. It comprises two 3,500kW propulsion motors, two frequency converters, electric propulsion panel, propulsion system control unit, main switchboard, uninterruptible power supply, and a panel of auxiliary electric drives. The ship has Azypod mechanical double-screw pod drives able to rotate through 360° in its submerged pod outside the hull. It is also fitted with bow thrusters for efficient operation in icy conditions. The diesel-electric icebreaker can sail at a maximum speed of 15kt and has a cruising range of 12,000mi. It can endure for approximately two months and can operate in approximately 1m-thick ice. It is certified to the International Convention for the Safety of Life at Sea (SOLAS) and the Environmental Protection Agency (MARPOL).